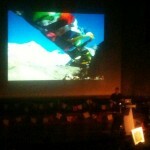 Everest’s Deadliest Day was the title of a debate at the Royal Geographical Society in London last week. The event was billed as an expert panel of the world’s top mountaineers discussing April’s avalanche in the Khumbu Icefall that killed 16 climbing Sherpas, and what it meant for the future of Himalayan climbing and the economy of Nepal. 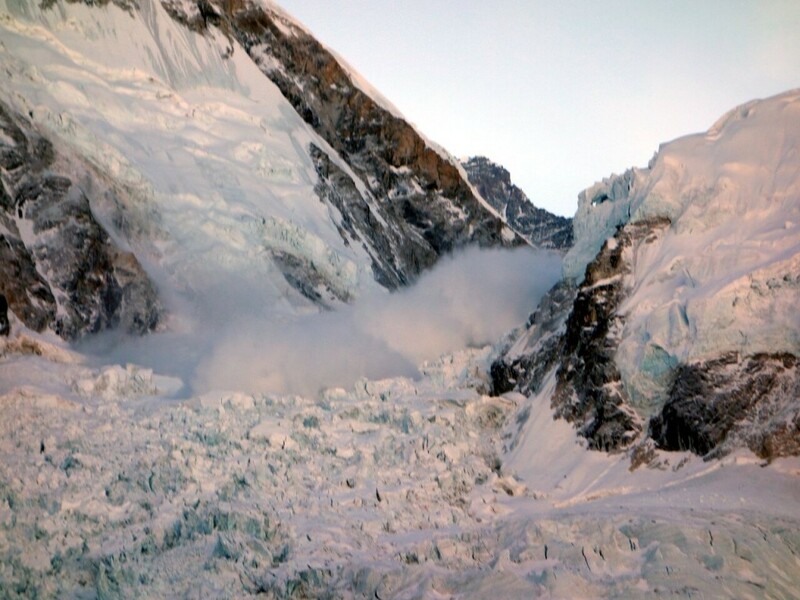 Having seen the avalanche happen as I walked through base camp that morning on my own way into the icefall, and witnessed many of the events that followed, it was a debate I didn’t want to miss. The organisers had put together an interesting group of people. Without wishing to malign the other panellists, Doug Scott was the only one who could reasonably describe himself as one of the world’s top mountaineers, but this was actually a good thing. 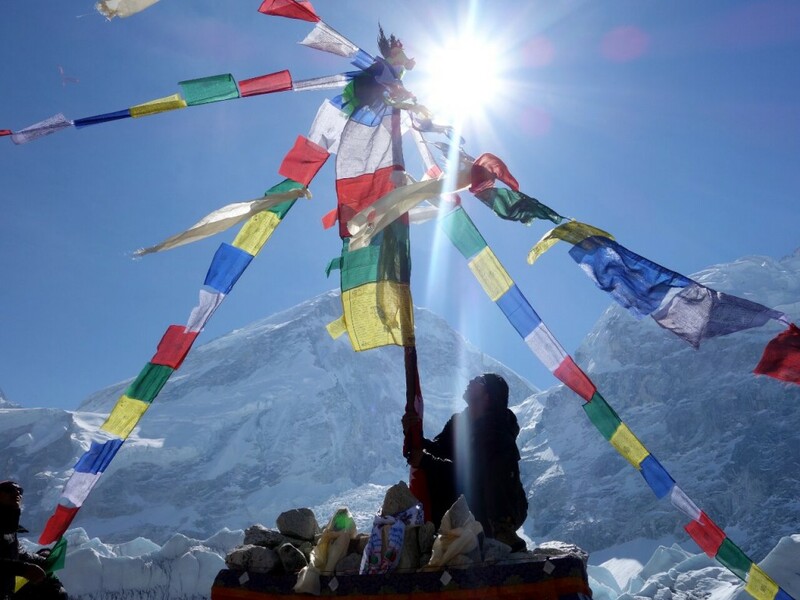 All too often when a controversial story emerges about Everest the media rushes to get the opinion of an elite climber, but Everest’s future has many stakeholders whose views are equally valid, and this particular debate included a broader cross section. As the first Briton to climb Everest in 1975, and one the country’s greatest ever mountaineers Doug Scott represented the alpinists and advocates of a purer style of climbing on Everest, but as founder of the charity Community Action Nepal he also has a broader understanding of what this might mean for Nepal. Rebecca Stephens brought a similar charity perspective as chair of Sir Edmund Hillary’s Himalayan Trust UK. She was also the first British woman to climb Everest in 1993. Journalist and mountaineering historian Ed Douglas provided the media perspective, but it was the other two panellists whose views I was most interested in hearing. Simon Lowe is managing director of the British expedition operator Jagged Globe, who lost a climbing Sherpa in the tragedy, and Dawa Steven Sherpa is managing director of Asian Trekking, the biggest Nepali operator, and also an ethnic Sherpa. It seems we are not yet ready to ask the opinion of two other important stakeholders, the commercial clients and the climbing Sherpas, but one step at a time. I live in hope this will happen one day, and Simon and Dawa’s participation represents a big step forward in the debate. The other member of the panel was its chair Ben Ayers, Nepal country director for dZi Foundation, the event organisers. Pronounced zee, the dZi is a stone some Nepalis wear as a necklace to bestow health and protection. The dZi Foundation provides support for rural villages in Nepal in the form of community development projects, and the debate was a fund raising and profile raising event for them. In this respect it was effective in my case, as I hadn’t heard of them before and was interested to read about some of the work they do. Ben has lived and worked in Nepal for 15 years, so himself had lots of interesting insider knowledge about the country to bring to the debate, though for the most part he kept out of it and saw his role as playing devil’s advocate with a series of leading and loaded questions (I might be being harsh here, and would be interested to know if anyone else at the event saw it this way). He started by asking each member of the panel where they were the moment they heard about the tragedy. Only one of them, Dawa, was at base camp, although Ed had been in Kathmandu in a meeting with the Himalayan chronicler Elizabeth Hawley, and Simon arguably found himself equally close to the action. He was at home in Sheffield, but had to take a call in the middle of the night to learn one of his climbing Sherpas had been killed and several others injured. He flew to Nepal immediately to meet their families (though declined an invitation from his expedition leader to take a helicopter to base camp and experience immediate altitude sickness). Ben asked Doug to describe his ascent of Everest in 1975. While it was a siege style expedition involving teams of support climbers carrying loads of equipment up to a series of camps as they gradually worked their way up to a position from which they could make a summit attempt, it had virtually nothing else in common with today’s commercial expeditions. They were the only team on the mountain (in accordance with the permit rules in those days), and made the first ascent of the Southwest Face, a route that has received only a handful of ascents since. It took place in the autumn season, and there were no fixed ropes on summit day for the climbers to slide up with jumars, as commercial climbers do. Doug and Dougal Haston arrived on the summit late in the afternoon, which meant they had to bivouac close to the summit on the way down. 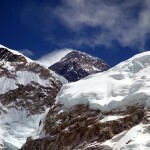 Only three other climbers (Pete Boardman, Pertemba Sherpa and probably Mick Burke, who went missing) reached the summit after them, and the rest of the team were content to play support roles. “And how should Everest be climbed these days?” asked Ben. “The same way,” Doug replied. This was the first debating point, and Dawa responded by saying that today Everest is more than just a mountain to be climbed. It provides jobs and livelihoods for the whole community, from climbing Sherpas, down to kitchen staff, porters and teahouse owners. It is a means for Sherpas to provide for their families, send their children to school and give them the opportunity for a better quality of life. He pointed out that Everest could still be climbed in the manner Doug described on any one of Everest’s 18 other routes, or by climbing in the autumn season when nobody else was there. Ed backed this up by saying Everest was Nepal’s calling card for the whole of its travel industry. Nepal needs Everest expeditions, and publicity for Everest impacts tourism elsewhere in the country. Ben then showed a short video clip of the celebrated climbers Melissa Arnot and Simone Moro talking about a party at base camp, followed by footage of some sort of rave inside a large dome tent. He showed Ralf Dujmovits’s much-publicised photo of a queue of climbers on the Lhotse Face, and another of a traffic jam on the Hillary Step. “Doug, did they have parties like that at base camp in your day?” said Ben. There were a few chuckles in the audience. But Ben wasn’t finished. 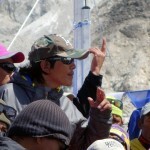 He showed a short clip of an interview with Norbu Tenzing, son of the great Tenzing Norgay. Norbu talked about how Sherpas have always been treated as second class citizens by the westerners who came to climb Everest. “I disagree with Norbu,” said Ed. “Sherpas aren’t victims. They are extremely resourceful. I find this attitude a bit patronising, and it doesn’t reflect how things are.” Dawa nodded his agreement. Perhaps inevitably Ben also showed footage of the brawl between Sherpas and climbers at Camp 2 last year and asked the panel for their thoughts. The brawl followed an argument on the Lhotse Face between the elite climbers Ueli Steck and Simone Moro and a team of Sherpas who were fixing ropes. I personally felt Ben was taking his devil’s advocate role a little too far by pitching the debate at the level of tabloid-style headlines. I didn’t believe for a minute he agreed with some of the questions he was putting to the panel to elicit a response. At one point he asked if they thought climbing Everest was ethical. None of them bothered to answer this question directly, but they had already answered it indirectly many times over by describing the importance of Everest expeditions to Sherpas and Nepal in general. He even slipped in a slide containing Outside magazine’s frequently parroted assertion that being a climbing Sherpa is more dangerous than being a soldier in Iraq, and quickly moved on without giving the panel an opportunity to point out that the assertion is patent horseshit (as I explained in a previous post). The audience were a little more educated than this, IMHO, and even if any of us believed all the stories we read in the media, we were soon enlightened by the panel. Thankfully the debate did become more mature, and there was an opportunity to discuss the finer detail about how commercial mountaineering on Everest should be managed in the future. While commercial clients like myself have taken a battering in the media and online discussion forums, the expedition operators have had a harder time of it, and have often been portrayed as villains who mistreat the Sherpas who work for them. With Simon and Dawa on the panel we were able to find out what operators do for the families of their employees when tragedy occurs. Dawa gave us some figures about the insurance cover that is provided for death, helicopter evacuation and medical fees. The death insurance has been widely publicised because it was one of the demands Sherpa protesters made to the Nepali government during the industrial dispute that followed the avalanche. There was some discussion between Dawa and Simon about the exact figure, but my understanding is that it was $10,000 USD at the time, and has since been increased to $15,000. This is the maximum amount: in other words Nepali insurers do not insure for more than this. 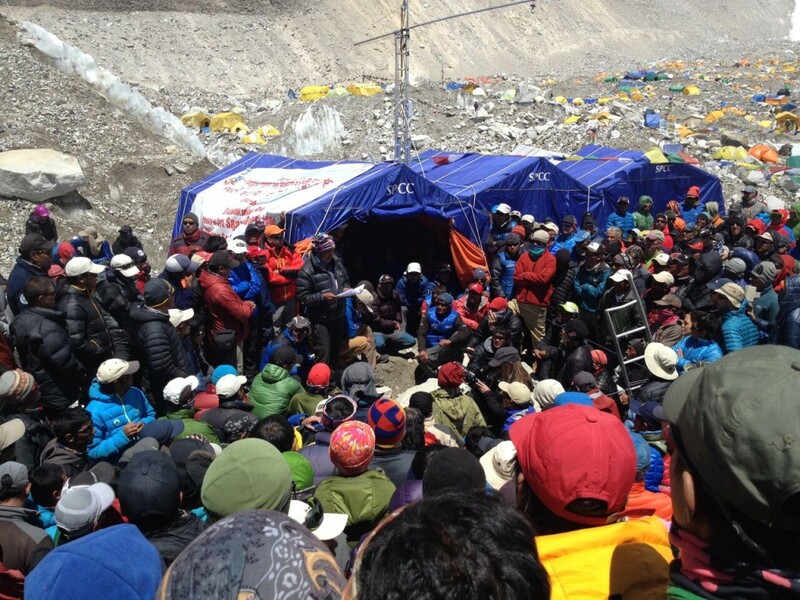 Dawa said that it’s not possible for operators to ensure their climbing Sherpas with foreign insurance companies. It’s debatable whether this is enough given that Everest climbing Sherpas often have to support extended families. The flipside is that even in the west life insurance generally only covers immediate family for long enough for them to find an alternative source of income (typically 4x annual salary). “It’s never enough,” said Dawa when Ben put the question to him. It then becomes the responsibility of operators to ensure families are looked after, and this is where there can be great disparity. 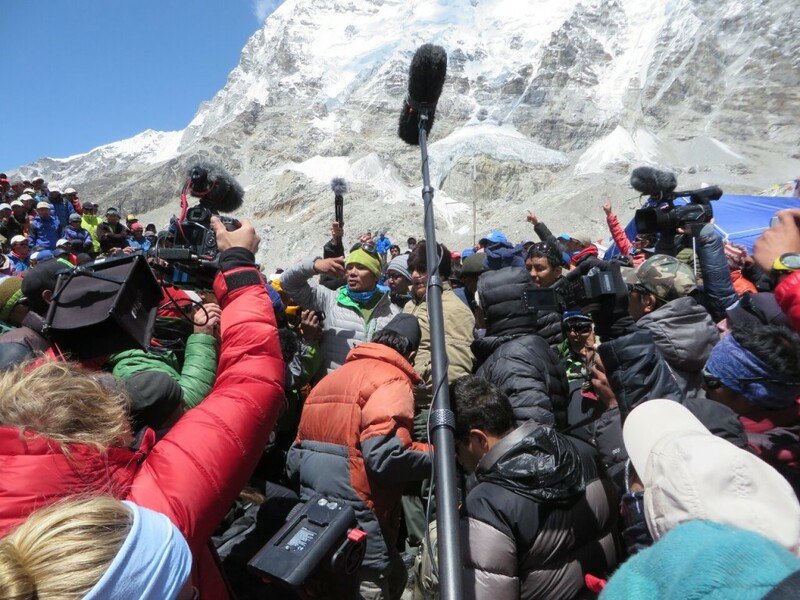 Simon explained that he met the family of Pasang Karma, the Sherpa employed by Jagged Globe who died in the avalanche, and they have made a commitment to support them for an extended period. 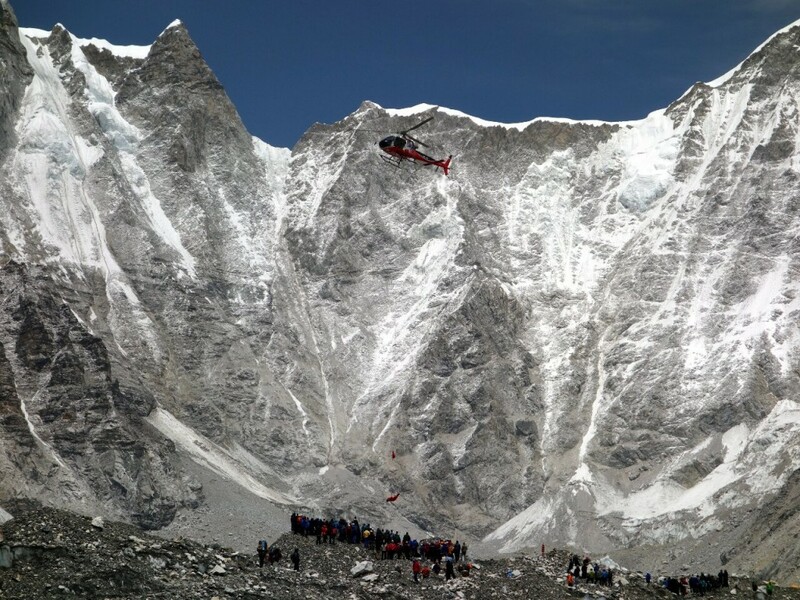 While they would like to be able to do this for any employee, he admitted it would have been very difficult to make such a commitment had five Sherpas died in the tragedy (as happened with the US operator Alpine Ascents), and that it may well have bankrupted them. In the case of a major tragedy like this, however, the international community rallies round with donations, as I have highlighted in a previous post. Ed stepped into the discussion by explaining that where Sherpa welfare is concerned very often it is the Nepali operators who are at fault. They hire staff who are less experienced, pay them a fraction of what the western operators pay, and fail to insure them adequately. Surprisingly Dawa agreed (although Ed did say Asian Trekking were an exception). Dawa said there was no regulation, that it was possible for any Nepali to take money from a client, register as a trekking agency, and organise an expedition to climb Everest. Many people had done this, and operated for just a single season. If there were any problems they could simply dissolve the company and register a new one under a different name. Simon explained that often the bigger operators picked up the pieces if a rescue was required of climbers who had chosen to climb with one of these rogue agencies. 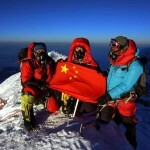 The panel talked about whether steps should be taken to limit the numbers of people who climb Everest. Unsurprisingly Doug was the most passionate advocate, but even he was not against any sort of commercial mountaineering on Everest. Ben asked the panel what they thought about stunts, bizarre records and the numbers of people using Everest as a stepping stone for other careers, such as sponsored adventurer or public speaker. “Can I ask you Rebecca, as someone who received a lot of publicity for being the first?” he said. Rebecca is an exception in that she has been able to make a career from it. 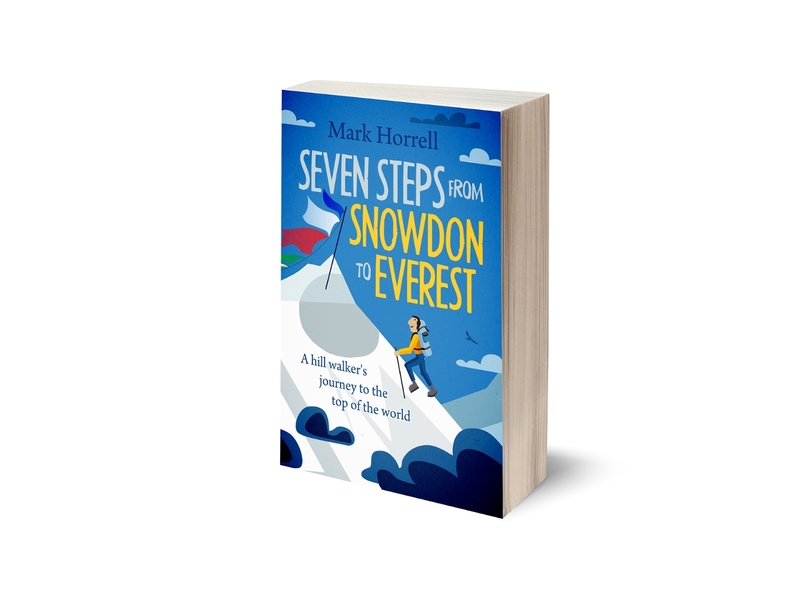 I was never going to be able to quit my day job after becoming the 318th Briton to climb Everest, and the same is true for most people who climb it, though it will always be a big event in our lives. Dawa appeared to agree. Ben concluded the discussion by asking the panel what they thought people in the room could do to improve the situation on Everest. Doug replied that anyone who wanted to climb it had a responsibility to look after the welfare of staff who worked for them. This included researching the credentials of any agency they used to ensure they paid their staff a fair wage and insured them adequately. Rebecca reminded us we can still donate to the Himalayan Trust, and to include a comment if we wanted our donation to go straight to the avalanche appeal. Simon added that potential climbers needed to educate themselves beforehand. They needed to understand that climbing Everest is not easy. He said journalists also had a responsibility to report accurately, and that they were partly to blame for this popular misconception. Media sensationalism was one of many issues that was only briefly discussed during the evening. Ed Douglas is perhaps unique in being a journalist writing for a mainstream publication (the Guardian) who is an expert on Nepal and commercial mountaineering on Everest, and writes about it objectively without pursuing a particular agenda. It would have been unfair for him to take the wrap for the faults of others in his profession. On one of the few occasions the subject arose he said it was ridiculous that climbers could blog about a rumour they heard in base camp, and it would be reported as fact in the media the following day. Despite my frustration at the level of debate posed by some of the questions at the beginning, I enjoyed the evening. I left with the feeling that despite the different backgrounds of the panellists, they were largely in agreement that commercial mountaineering on Everest is not only inevitable, but a good thing for Nepal. 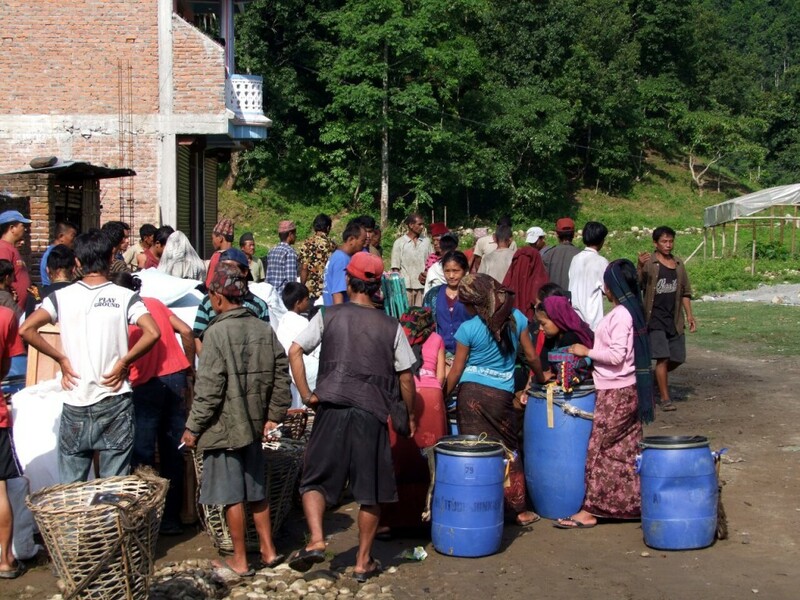 The question is not whether it is ethical, but how to manage it in a way that provides the most benefit to the communities who rely on it, both in Nepal and outside. Ben said the dZi Foundation intended to make the Everest debate an annual event, and asked the audience to think of ideas for the next one. This isn’t difficult, as there were many issues either only touched upon briefly or not covered at all. I’ve mentioned media sensationalism; pollution and the environment is another popular topic that didn’t get much time here, although it does frequently in the media. Climbing ethics was never discussed: should limitations be placed on the level of support provided to commercial clients? What if anything did the panel think was likely to change after the tragedy? We didn’t talk much about risk. We all know climbing Everest is no picnic, but just how dangerous is it and what can be done to make it safer? And then there is the politics. I would love to have known what the panel thought of the Sherpa strike that followed the avalanche, and the many demands they made to government. Were climbers and operators their target, or were we just caught in the crossfire of a dispute with government? Nepal’s Ministry of Tourism got off lightly, although Ed did briefly allude to some of their failings. He mentioned that permit fees were primarily just a revenue generator for government, rather than being invested in regulation and services on the mountain. He could have gone further and talked about the widespread corruption (there was a delegation from the Nepalese embassy present, although they left during the interval). Some of these questions were discussed on the Twitter hashtag #dzieverest after the event, and I’m sure after the 2015 season the debate will have moved on even more. Ben used some of my own footage from base camp this year during the evening. Before I sign off we should remind ourselves what happened that day. Here once again is the short film I put together when I returned. Thanks, Chip. Looks like you’ve published a few features this week. I have them bookmarked for bedtime reading! Sure thing Mark. I think you were the first to publish an estimate of the size of the avalanche from your friend Mel Wang, which was picked up in Outside. The Nat Geo cartographer did a pretty thorough job trying to refine that number. Here’s a little report about him with a telling before and after picture. Heehee, it’s funny to think Outside magazine might be reading my stuff and picking up on it after all I’ve written about them – a nice thought but I’d be very surprised! Thanks Mark for covering this. I’m moderating a similar panel at the 2015 American Alpine Club annual conference in New York in January.